Annie Paskett was born at Grouse Creek, Box Elder County, Utah on February 6, 1881, a daughter of Philip A. Paskett and Emma Richins. She was the fourth child and the third daughter of her parents. She was born in the old rock house which Clarence Richins and family later occupied. Her father and James Simpson, a stone mason, built the house and she was born in it before the plaster was quite dry. They placed a tub of water in the house with the idea that it would draw the moisture and help dry the plaster. Aunt Ellen Simpson was the midwife at the time. She and Emma Richins Paskett exchanged services as midwife; it was a matter of helping one another. Emma Richins Paskett helped deliver most of Aunt Jane Richins’s children, Ellen Simpson’s, Sarah Kimber’s and the Tanner twins. Her last cases were Elaine Frost’s first children as she helped her daughter Emmie with these. Annie’s parents were married in the old Endowment house in Salt Lake City. Their first two children were born at Henefer, Utah, then they moved to Grouse Creek. Philip was born in a dugout house south of Uncle Bill Paskett’s across the valley. When Annie was about two years old, she was injured painfully when her sister Emma attempted to pull her from behind the bed where she was securely lodged. Her arm was pulled out of the socket at the shoulder. She suffered serve pain, but there was no doctor available and her father did not know how to put the arm back into place. He prayed about it and went to sleep, dreaming how to do it. The next morning he put the arm back into place just as he had dreamed how to do it. Annie’s father, Philip A. Paskett, had the gift of healing. He blessed Tom Toyn and Tom was healed. He administered to a boy at Oakley, Idaho who was very ill and the boy was made well. One time his wife had a severe toothache and after he gave her a blessing, she was relieved. Hattie Nichols was Annie’s first school teacher and Louis Ingram was her second teacher, both from Brigham City. Peter Olsen taught her in the third grade and a Mr. Nixon was her teacher in Huntington,Utah. She attended part of a year at Basalt, Idaho, then at Grouse Creek, Utah. James Larsen was her last teacher. Her closest playmates were Annie Richins (Morgan), “Pen” Paskett, William Paskett and William Betteridge, all cousins. They played a number of games the favorites being “steal sticks,” “hide and seek,” “run sheep run,” “hop scotch,” and “ball.” Dancing was one of the main amusements. There were children’s dances and they learned to dance when very young. “Will” Betteridge taught her how to waltz. 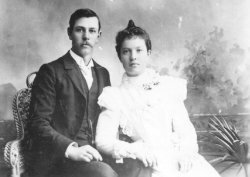 Annie was baptized by her Uncle William Paskett at the Kimber Ranch on November 1, 1890. At that time of year, the water would be very cold. She thinks her father confirmed her a member of the church soon afterward in regular fast meeting. Her father had rheumatism so severely at one time that he felt he should move to a milder climate. When Annie was about ten years of age, the Paskett family sold their holdings in Grouse Creek intending to go to Mexico. They crossed the salt flats in the fall of 1891 and reached Huntington, Utah, after a journey of hardships, where they spent the winter. In June 1892, her father decided to leave for Snake RiverValley in Idaho. They were given the opportunity of putting up hay for half of the crop, so they settled there. Times were hard and the Pasketts suffered privations while in the Snake River Valley. This was during Grover Cleveland’s administration and the depression was severe throughout the entire nation. Strikes were taking place on the railroads and other places and many men were out of work. As their place was near the railroad, many tramps came to their door asking for food and a chance to work. The Pasketts fed them for they had bread if not much else. Philip had worked and received his pay in wheat so they had a year’s supply of flour on hand. Annie remembers the flour in 100 pound sacks. She made the bread, cooked most of the food and did the scrubbing. Her mother did what she could with her hands but was unable to get around. At one time there were three small children in diapers. Her brother George was born in Basalt. The midwife had to return home soon after the baby came, so 13-year-old Annie sat by the bed and bathed her new brother under the direction of her mother. She also cared for her mother during confinement. 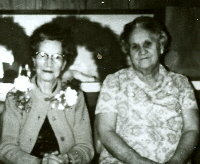 At this time the older sister, Emmie, was married and living at Grouse Creek. Lottie married Hyrum Croft at Basalt, Idaho, so Annie had to assume the responsibility of the household. She did the washing with Pollie helping by doing the stockings, but that did not take long as they had few clothes. They had one cow and the three babies in the family consumed most of the milk, so the rest of the family had to eat mostly bread and “withit.” At this time the Paskett family was living on a plot of ground they had purchased from George Richins. They lived in a tent and covered wagon at Riverside, across the snake river from Blackfoot. Their new neighbors each gave them one or two hens, so the Pasketts had made a dugout chicken coop for their dozen hens. One day Annie went to town with the neighbors in a wagon. Her friend was Daisy Slack. They went to Blackfoot to market. She had to sell the few eggs they had in order to buy salt, bacon and sugar. The family needed the eggs for food but they needed other things too. Annie disliked going to market but she went anyway. They came to a stream of water and in crossing, one of the horses leaped ahead, the spring seat came off the side and everyone was upset. Daisy was holding a black umbrella over them. The jolt tossed the eggs onto the umbrella and spoiled both eggs and the umbrella. No one was seriously hurt, but Annie felt bad and cried over the incident. Near this place were men panning gold on the river bed, who bought all the eggs that could be salvaged. Jake Slack, the man in charge, paid for the eggs. He saw Annie many years later at Etna, Utah, and recalled the incident. The Paskett family returned to Grouse Creek, Utah, feeling that their sojourn in Idaho had been a failure. Philip Paskett’s health was very poorly. His rheumatism was such that he had to be moved on his bed, being practically helpless. He sent for his brother‑in‑law, Albert Richins, to come to Idaho and help move them to Grouse Creek. From the age of fourteen until her marriage at eighteen, Annie worked at home and for others. She worked for Emily Barlow Tanner for more than a year at the time when Raymond was a baby. She worked also for Amanda Barlow Tanner and during the Summers, she worked for Maud Thomas. Her first church position was a teacher in the Sunday School at Etna. This was when Roy and Lester were little. Sacrament meeting was held at Etna once a month, but Sunday School was held at the schoolhouse every Sunday. She taught Sunday School at Grouse Creek after Lavern was born. She was asked to work in the Mutual but lacked confidence in herself and talked herself out of it. She shunned anything where she had to appear before the public but was always a willing helper in community or church projects. To help make a living, she took in boarders while raising the family and this besides taking care of the milk, making butter and many duties that go with the farm. Annie kept company with Jesse for four years. He took her buggy riding in Allen Tanner’s new blacktop buggy and they went horseback riding. They went dancing in the old log meeting house. To be married they drove to Salt Lake City via team and wagon around the north end of the Great Salt Lake and throughOgden. 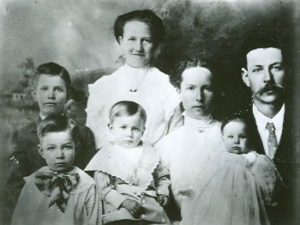 Jesse’s mother, Amanda Barlow Tanner, and her husband, Valison Tanner, accompanied Jesse and Annie to the Salt Lake Temple, where they were married on November 8, 1899 by President John R. Winder. They left their covered wagon and team at Slaterville, which is west of Ogden, and from there took the train to Salt Lake City. Ralph, Valison Jr. and Olive, accompanied their mother on this trip. Olive was sealed to her mother and Joseph Smith Barlow at this time. Ralph and Valison Jr. were sealed to Valison Tanner and Mary Tanner by permission of President Lorenzo Snow. Amanda took the three children and returned to Grouse Creek via the train, but the newly married couple and Valison returned to Grouse Creek in the covered wagon. This was their honeymoon. When first married they lived on the Mecham ranch which was later the Dell Hart ranch. Lorenzo Mecham, who had owned the ranch, had known the Prophet Joseph Smith personally. The next year, in 1900, they built the log house with one room and porch at Etna, just before Emma was born on August 9. Jesse and his brother Joseph built this house with the help of Uncle Arthur Richins who did the carpenter work. All nine of Annie’s children were born in this house. As the family grew in numbers, more rooms were added and also a large cellar. 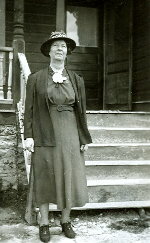 Ellen Blanthorn served as midwife at Emma’s birth. She weighed more than seven pounds at birth and Annie was ill for nine months afterward. They used kerosene lamps during all the years she lived in Grouse Creek. She moved to Brigham City in 1948 and electricity came to Grouse Creek in 1949. At the log house on the ranch, water was carried into the house from a barrel nearby where it was piped from a well about forty feet away. When Roy Jesse was born on November 9, 1902, Ellen Blanthorn was engaged as midwife, but she had gone to Oakley, Idaho to obtain some teeth and didn’t return in time. Laura Warburton, a neighbor, was asked to come take care of the birth and everything progressed well. Roy weighed between seven and eight pounds. Melvin, a premature baby was born on June 28, 1904 and lived but six hours. Richard Warburton blessed him with a name. Melvin was buried at Grouse Creek. Joseph Lester was the largest of the nine children, weighing ten pounds. He was born on April 16, 1906. Francis was the smallest baby at birth, weighing only six pounds. He was born on November 7, 1908 and christened by his Grandfather Philip Andrew Paskett. Adella arrived on December 18, 1910 and was also christened by her Grandfather Paskett. Louise was born on February 4, 1913 and christened by Bishop David H. Toyn. Sidney Raymond was born on November 24, 1914. He had been a large healthy baby and had dark complexion, quite like Lester. He died of pneumonia when he was only three months old on February 16, 1915. He was buried at Grouse Creek. After the birth of her ninth child, Inez LaVern, on January 27, 1916, Annie was not well. She went to Ogden to the Dee Hospital and underwent a serious operation. She was in the hospital for her thirty‑eighth birthday. Dr. Ezra Rich was the surgeon. Grandfather Paskett came over and she told him of the dream, asking him if he could tell her what it meant. He said, “You should get the Bishop and his counselors to administer to Emma instead of calling the doctor.” Emma was administered to by these brethren and was healed. Annie received warnings through dreams many times in her life. These were for the benefit of herself, her children and her grandchildren. She was warned in a dream that she would not raise Sidney Raymond, but that he would be taken. When Wesley, Roy’s son, was four years of age, he had pneumonia for the first time. Annie went to his home, twenty-seven miles away, to help and Wesley grew worse. They knelt around the bed and prayed that it be made known to them whether Wesley should be taken to Ogden. Annie was impressed that he should be taken to Ogden. She and Roy took him and Dr. Jensen met them at the railroad station. They rushed him to the hospital and placed him under an oxygen tent. It was discovered that he had bronchial pneumonia. Annie stayed until they were able to take Wesley back home in Lucin. In 1938 when Wesley was ill with pneumonia the second time and was in the hospital in Ogden, Annie had another of her warning dreams. She dreamed she went to Lucin (where Roy and Nell and the family were living) to see how things were and found Carol Ann (Wesley’s sister) seriously ill.
She dreamed that she tried to catch the stage but missed it and she floated through the air. She related this dream to her husband Jesse and upon hearing it, Jesse hurried with his chores and then they drove to Lucin. There they found Carol Ann seriously ill. Jesse took care of the U.S. Mail for Nell. (Nell operated the Post Office at Lucin) and Nell took Carol Ann to Montello, Nevada to the doctor who diagnosed it as pneumonia. 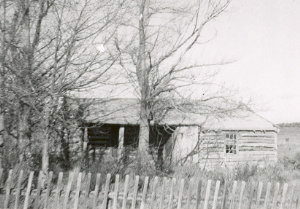 The Barlow family lived at Etna on the ranch until 1922 when they moved into the home of Joseph Barlow, Jesse’s brother, at Grouse Creek, which home Jesse had purchased. They continued to run the ranch at Etna, which was sold to Richard Warburton several years later. They sent Roy on a mission to the eastern states in 1924 where he was released in 1926. Lester served two and one half years in the California mission, leaving his ward in Salt Lake City in May 1933. Francis served more than two years in the Armed Forces beginning in 1943. He went to New Guinea and the Philippines. First and foremost in Annie’s life was her family. No sacrifice was too great for her to make for her loved ones. Her special talents and interests have been in the line of homemaking. She had the faculty for making money go a long way. She was a good housekeeper and an excellent cook. She was an expert in making butter, bread, cakes, pies, doughnuts, cookies and many other tasty morsels. She was a good seamstress and learned it all by herself. She made dozens of quilts. Two of the nicest were a star and one with sateen on both sides, quilted beautifully. She was an expert in making fancy handkerchiefs. Her braided and crocheted rugs have been her greatest achievement in the line of handiwork. In 1954, when this was written, she had made 130 rugs since coming to Brigham. In that same period of six and a half years, she crocheted edges on more than a hundred handkerchiefs, doing the single and double knot stitch. She has crocheted several knot stitch wool scarves and a baby shawl for a great‑grandchild. She has taken cash prizes and blue ribbons for seven years at the county fair and three times at the state fair, for both braided and crocheted rugs and for handkerchiefs. In 1940 she and her husband took a trip to the World Fair at Treasure Island near Oakland, California and they had a most enjoyable time. On their way home, they stopped at Sparks,Nevada to see a sister, Christine, and her husband, Arthur Richins. Art and “Tina” took them to Reno, Carson City and Lake Tahoe. Annie went to Yellowstone Park in 1951 with Lester and family. 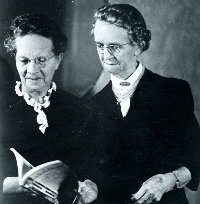 In 1953, accompanied by her daughter Emma and sister Rose Thompson, she visited her brother Philip J. Paskett in Firth,Idaho. They attended the celebration in honor of Philip’s golden wedding. She saw many relatives and friends she hadn’t seen in many years. In genealogical research she has participated by helping to finance it and she has been anxious to add to the meager information available on the Richins and Paskett lines as well as the Barlow line. Annie accompanied Lester through the Temple in Salt Lake City when he went on his mission and later when he was married. Also, she accompanied Francis through the Salt Lake Templewhen he was married. She also went through the Logan Temple. Her patriarchal blessing was given by Joseph F. Smith, Presiding Patriarch to the church on October 11, 1944. She was sixty-three years old at the time. Some of the outstanding people she has known are: Lorenzo Snow, Rudger Clawson, President David O. Mackay, Nicholas G. Smith and Joseph Fielding Smith. At Grouse Creek she took boarders, mostly school teachers, and her home was used as a hotel for the travelers who came to that area. The Barlow home was one of the first to have modern plumbing in that end of the county. Among those who stayed there were Charles H. Skidmore, County Superintendent of schools, Bessie Hansen, County Demonstrator, Fred L. Peterson and his wife, Monte Harmon, school supervisors and school doctors and nurses. In 1931 Jesse Barlow was thrown from a load of hay when the team was frightened and jumped ahead. In this fall his back was injured and gave him much pain the rest of his life. OnOctober 4, 1942, he died of cancer caused indirectly by several injuries received from accidents. Early in 1947, Roy, who lived in Brigham City, had a strong impression that all was not well with mother who was still living in Grouse Creek. He immediately drove out to Annie’s home and found her ill. He bundled her up and left for Brigham City. On the way he met Emma and Ted (Emma had the same impression that Roy had), so Emma and Ted returned toBrigham City. The doctor diagnosed the illness as pneumonia and treated her accordingly. Annie remained with her daughter, Emma, for a month or two during her recovery then returned to her home in Grouse Creek. Annie was lonely after her husband’s death as all her children were married and all had moved away except Louise, who still remained in Grouse Creek. 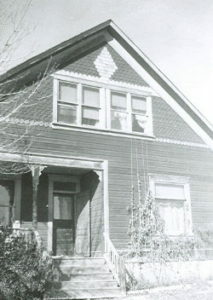 In October 1948 she sold the house in Grouse Creek and moved to Brigham City. She rented a little apartment at 15 South 2nd East. 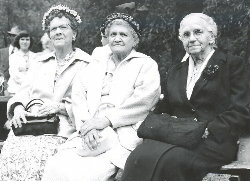 Emma, Roy and Inez LaVern were living inBrigham City. Annie was 5 ft 3 in. tall and of medium build, with brown hair which had very little gray in it as of 1955. She enjoys attending Sunday School and Sacrament meetings and especially Relief Society meetings. Annie kept house and lived alone until she was eighty-nine years of age when her health began to fail. She was visited almost daily by some of her family. 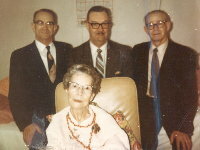 A son, Roy J. Barlow, a daughter, Lavern B. Frye and a granddaughter, Velma Kimber Jensen, all of Brigham City, took very good care of her during her declining years. She was visited frequently by her son, J. Lester Barlow, a daughter, Adella B. Bigham of Salt Lake City and a son, Francis Barlow, of Provo and occasionally by a daughter, Louise Barlow Ballingham of Sparks, Nevada. Her health continued to decline slowly and it became apparent that she was in need of twenty-four hour a day care. Annie, with her children, concluded it would be in her best interest to enter her in the Pioneer Memorial Nursing Home in Brigham City where she could have qualified nursing care around the clock. She moved there in August 1969. Here she had excellent care and had many visits from family and friends. Annie never complained and she kept her sense of humor until the day of her passing, which was ten days short of ninety-four years of age. She was indeed a noble spirit. Lorenzo Mecham owned an ox team which Annie saw many times, so it can be said that she lived from the age of the ox team to the rocket age‑a great privilege. Her life was complete with sacrifice and service. Annie peacefully left this mortal life on January 27, 1975 with a grateful heart for her blessings and firm in the faith of the gospel. Burial was in Grouse Creek cemetery, by the side of her husband Jesse Barlow. Written by Nell Lovell Barlow through the year 1955 and the remainder written by Joseph Lester Barlow.